At the beginning of the 20th century when large numbers of Armenians began to arrive in America, some by choice and others because of tragic events that were happening in their homeland, many chose the small town of Whitinsville to begin their new lives and to raise their families. Life wasn't easy for these newcomers --- most lacked skills, money, and few spoke the English --- but they managed because of the strength of their character and faith in God. As they integrated into their new country and began raising families, their thoughts turned to building a place of worship --- a church to ensure the survival of their religion, their culture, and their heritage. A committee was formed and the process of obtaining funds began. Interest was high and many volunteered to help secure funds to begin the long-awaited task of building out church. After four years of hard work, Koopman Lumber completed the construction, all of which was paid for without a mortgage. Soorp Asdvadzadzin Church was consecrated on November 24, 1957. The rites of consecration were performed by His Eminence, Archbishop Khoren Paroyan, Prelate of the Cilician See and official Nuncio of His Holiness, Catholicos Zareh I, Catholicos of the Great House of Cilicia. The church was named Soorp Asdvadzadzin (Holy Mother of God) after a church of the same name from the Armenian village of Pazmashen. 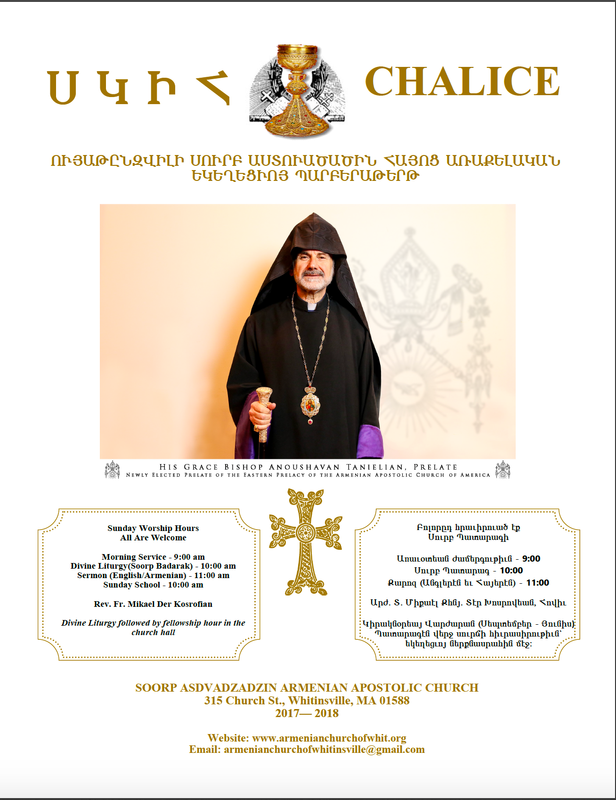 The membership elected a Board of Trustees, who with the help of our faithful people began to form a Sunday school, choir, and secure a pastor who would provide instruction in the teachings and doctrine of the Armenian Apostolic faith. For over fifty years, the flame that inspired our founders has never faltered. Successful picnics, bazaars, and other functions have helped provide for our financial needs; while dedicated pastors, members of the Board of Trustees, deacons, choir, Sunday School and Ladies Guild have faithfully carried out their duties to maintain our church's sacred traditions and keep our faith and Armenian heritage vibrant for generations to come.